After putting out a couple of lovely Homeworld: Deserts of Kharak story trailers (here and here if you missed them), Gearbox today released a proper gameplay video showing off nearly seven minutes of action recorded during an “Artifact Retrieval” multiplayer match. Despite taking place on the surface of a single planet, Deserts of Kharak, at least as it appears in this video, looks very much like its space-based predecessors. Massive land-based carriers—“at once a battleship, a support vehicle, it's your key economic unit”—are the focal point of the game, while smaller, special-purpose units roam the desert in formation, working in concert to support one other in battle. 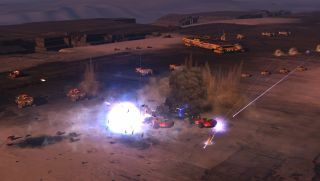 Homeworld: Deserts of Kharak will be out on January 20.